The Oklahoma City-based craft store chain’s devout Christian owners have long shown an interest in the biblical Middle East and started to collect artifacts from the region in 2009, according to a civil complaint filed in New York on Wednesday. Hobby Lobby President Steve Green is the owner of one of the largest collections of religious artifacts in the world and is building a Museum of the Bible in Washington, D.C., due to open in the fall. Importing Iraqi cultural property into the United States has been restricted since 1990 and banned outright since 2004, according to the complaint. Under Iraqi law, all antiquities found in Iraq are considered property of the state and private people cannot generally possess them without authorization of the Iraqi government, the complaint says. A dealer based in the United Arab Emirates shipped packages containing the artifacts to three different corporate addresses in Oklahoma City. Five shipments that were intercepted by U.S. customs officials bore shipping labels that falsely declared that the artifacts’ country of origin was Turkey. 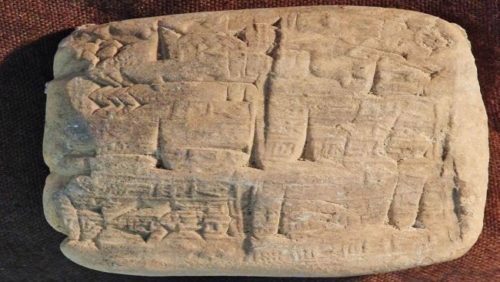 Hobby Lobby consented to the fine and forfeiture of thousands of tablets and bricks written in cuneiform, one of the earliest systems of writing, as well as other artifacts that prosecutors say were shipped without proper documentation, the complaint says. It’s not the first time that religious beliefs have put Hobby Lobby in the headlines. The chain challenged President Barack Obama’s Affordable Care Act, saying it didn’t want to provide certain forms of birth control for its employees, citing religious objections. In June 2014, the U.S. Supreme Court ruled 5-4 in Hobby Lobby’s favor, saying the company’s rights had been violated under the 1993 Religious Freedom Restoration Act.